Children learn these things even before they learn to read words by listening to books read aloud by parents. These concepts do not need to be taught but mostly experienced. As a first grade teacher, reading and literacy were a huge part of each day. I gave the concepts-of-print test in the fall and children who had been read to at home earned higher scores than those who had little experience with books. I felt sad for children who could so easily have been more prepared for learning at school. 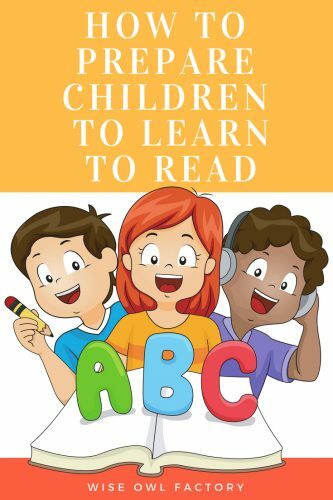 To read, children must have some experiences which can be very child-friendly and age appropriate and fun. 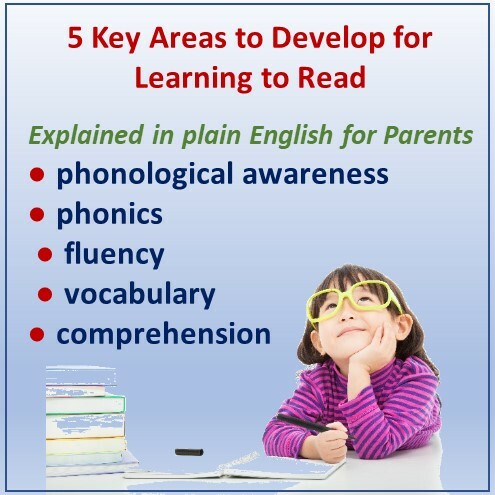 The five areas include possibly too much teacher-talk vocabulary for parents: phonological awareness, phonics, fluency, vocabulary, and comprehension. 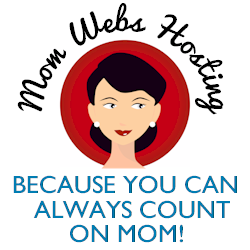 I hope to make these easy for parents to understand in the rest of this post. 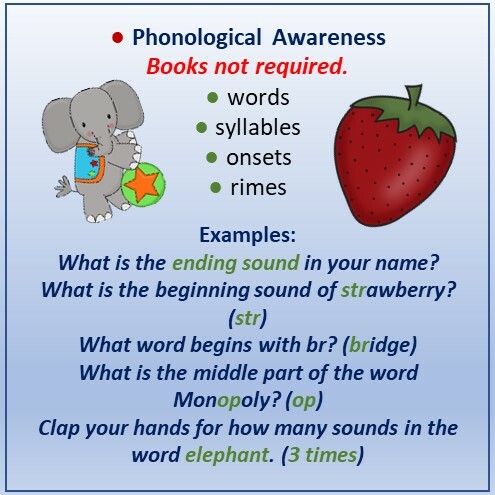 Phonological awareness at home can be developed with word games (no text, no book required) such as tell me the first sound of your name, what is the last sound of daddy’s name, and is “m” the middle sound in mommy? Rhymes read or told aloud are important. Yes, Mother Goose was helpful for children learning to read although now there are much nicer stories. Jump rope rhymes, seeing how many words begin with “str” like strawberry (str is a rime with the s onset followed by a blend of letters), and singing songs are all excellent ways to help children hear sounds in words prior to reading. Games may be played while riding in the car, waiting at the dentist, and before bedtime. During a meal, the parent might say something like, “Oh, you just ate a food ending with the r sound (peanut butter).” The child isn’t taking a test and should not be put on the spot. The parent can talk while the child begins to absorb the ideas. I am sure you will start getting your own ideas once a few examples are tried. Phonics is something that begins with a few simple sounds and then builds upon the initial learning as the reading code is mastered. Prior to reading, this is something that begins when the child wants to write. Children actually are natural writers about age four before they read, and that time is a window of opportunity for parents to begin teaching phonics. Teaching? No, helping, but naturally and in small amounts at a time. The child might ask, “How do you spell mommy?” As the parent says what sound do you hear first? The child probably knows “m” already, and just needs some reassurance that it is the correct letter. That is phonics at the most basic level. Eventually, the child is able to sound out words (probably phonetically with some incorrect spelling, but this is another important stage in learning to read). Remember when your child was learning to talk and said something like susgetti for spaghetti? You were thrilled, right? So don’t be upset when your child writes how he or she hears the word. Be thrilled! It is progress! Approximation is the road to learning, and repetition is the key. They won’t spell phonetically forever. Remember, they eventually gave up diapers, right, although it may have seemed like it would never happen? Relax and have fun as your child learns to write. 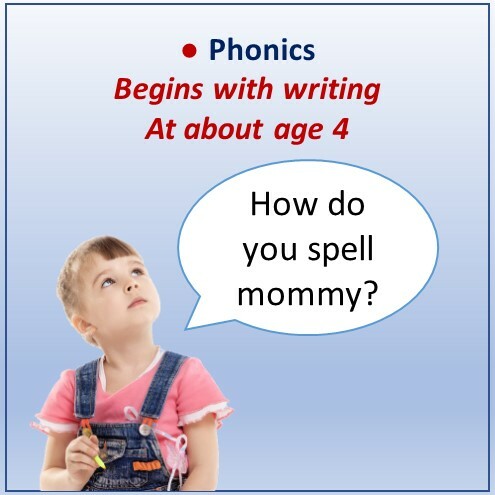 Of course, phonics involves so much more, but just help your child get started in the learning. So many times parents asked what “else” they could do besides reading to their children. The answer is to do some writing! Help your child write when he or she wants to do so. And while this topic is under discussion, remember, teaching capital letters only isn’t enough. They actually don’t need that much teaching as names begin with capital letters and it is naturally learned and reinforced. A few letters will require teaching such as Q, however. 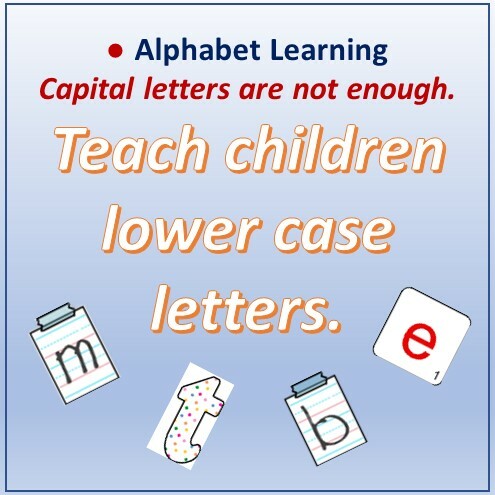 Do teach your child to write with lower case letters which have little natural everyday learning opportunities. This is extremely important for parents to realize as the words in books (reading, remember) have mostly lower case type. Looking for lower case letter magnets or stickers or blocks just shows how difficult it is to find such items. At the craft or hobby store, capital letters in wood or foam abound. If you find lower case items buy them and use them at home. 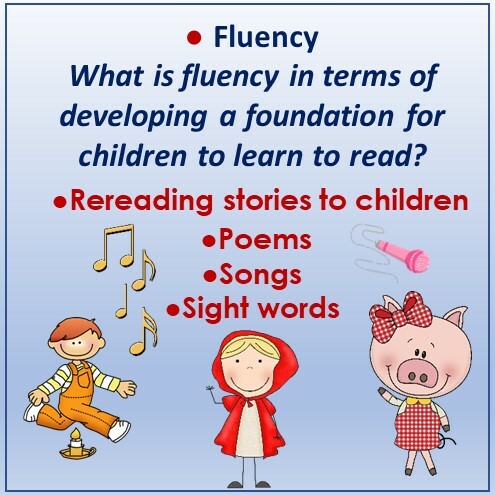 Fluency before actual reading involves rereading of stories aloud to children (yes, you will have the books memorized), saying poems, singing songs, and learning a few sight words. Phonics are necessary but so are sight words. It is not an either-or situation. Both are required. So, what are these sight words? It begins with recognizing the initial letter on signs the child is familiar with such as restaurants or stores. It is good when children begin noticing letters on signs. Later, hopefully, before school, some words such as it, is, Mom, Dad, the, that, love, and so on help with fluency as the child will have what teachers call “automaticity” so he or she does not have to stop and think. These words are not to be sounded out, simply memorized. Teachers use the term Auto the Otter instead of using the word automaticity when working with the children. Actually, part of the fall testing was to have each child write out all the words he or she could spell. At this link, there is a free printable for something called Fry Words 1a and 1b, which are basic sight words. Please also see this blog post with a free printable about Auto the Otter and some basic sight words. Later fluency might become difficult, so this post helps parents understand when more advanced readers may be having issues. Having plays where children act the parts also helps fluency, as they repeat their lines (even if just made up on the spot). Why do children need a large vocabulary before they learn to read? So the words will be familiar and when sounded out, will make sense. When any of us learn something new, some familiarity with the subject or topic helps provide some scaffolding for the learning. Cooking? What if you didn’t know what a kitchen was, or what any of the utensils were? It helps to have what teachers call background knowledge. If a child encounters the word dinosaur but doesn’t know what a dinosaur is, there are two things to learn. This is a link to a post with dinosaur matching cards to help children learn the names of dinosaurs, which is a fun vocabulary activity. Now the children might just match the pictures, and do not actually read the rather big words on the cards until they are advanced readers. So, yes, looking at pictures is a support for the children. Big Words for Little People by Jamie Lee Curtis and Laura Cornell would be a nice book to share with a young child. Dinosaur books, kinds of dog books, kinds of gem books, and other nonfiction books help in this area. Yes, parents, you have my sympathy as you will be asked to read them over several times. I did that, too. Discussing books with children is always great, too. 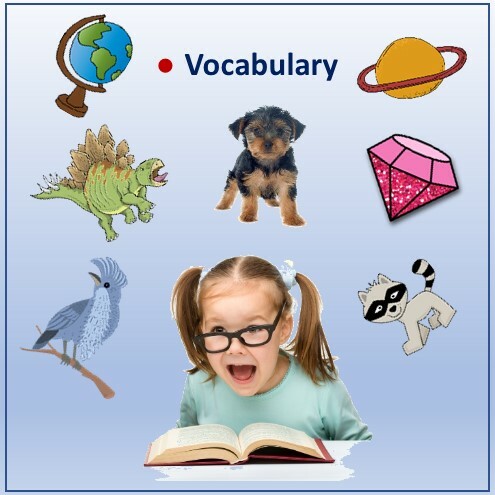 By the time a child is 12 years old, he/she will understand (have a receptive vocabulary) of about 50,000 words. Get ready, parents and teachers! 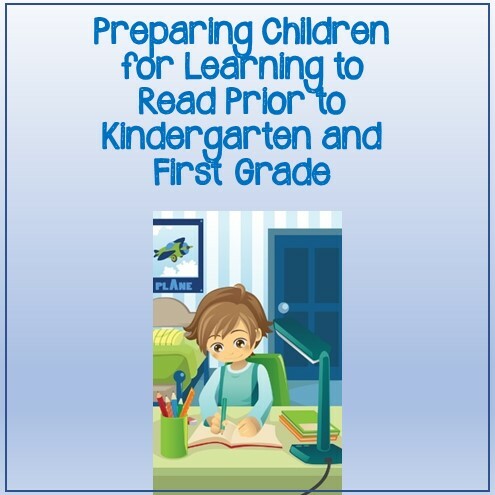 Reading comprehension can be developed prior to learning to read. Really. 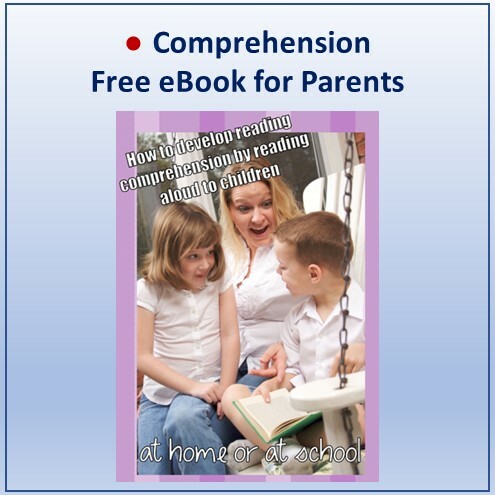 I wrote an entire PDF eBook A to Z on this topic, and you may find it free on the parent page. It is really my favorite subject. School does much teaching, but learning prior to school is easy when children are little sponges and soak up everything around them all day long. I hope you will like the eBook PDF. 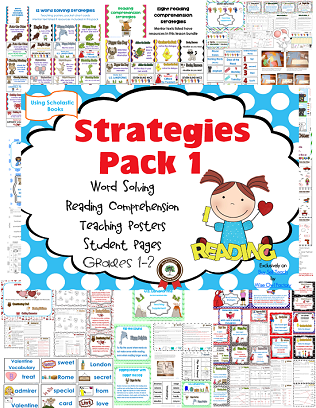 You might also like to know what teachers really do to teach literacy, and the “secrets” are in my free 170 page PDF about word-solving and reading strategies pack 1. The information about this printable is at this link. 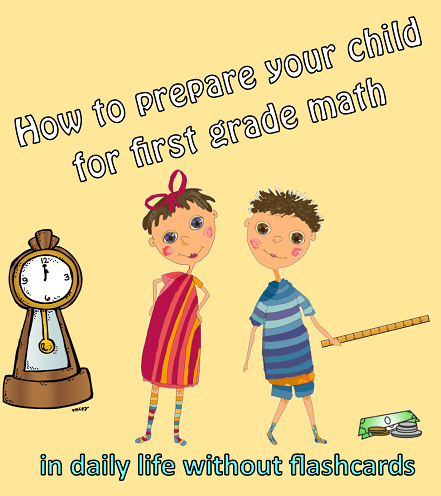 How parents might help prepare children for first grade math is discussed at this post, with several practical tips. No flashcards or worksheets required! If your child is worried about going to school next fall, this informational post will offer some ideas for discussing those fears. 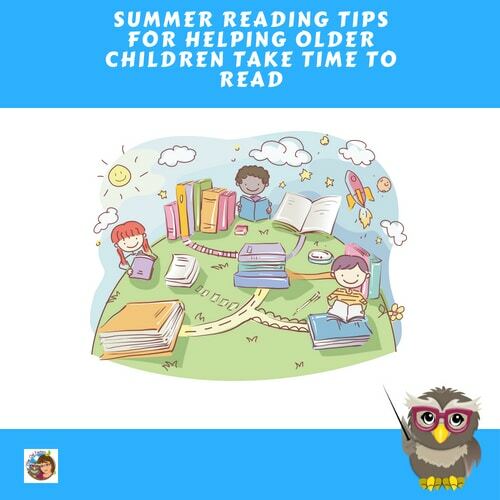 If your child is already reading, the information in the post at this link may help prevent the summer slide.